Book Summary: Imagine your father is a monster. Would that mean there are monsters inside you, too? Nineteen-year-old Ry Burke, his mother, and little sister scrape by for a living on their dying family farm. Ry wishes for anything to distract him from the grim memories of his father’s physical and emotional abuse. Then a meteorite falls from the sky, bringing with it not only a fragment from another world but also the arrival of a ruthless man intent on destroying the entire family. Soon Ry is forced to defend himself by resurrecting a trio of imaginary childhood protectors: kindly Mr. Furrington, wise Jesus, and the bloodthirsty Scowler. Ever since I read Rotters by Daniel Kraus, I know that as an author, Kraus has the ability to keep me up awake and scared at night. He is definitely the first author I think of when I think of YA Horror. 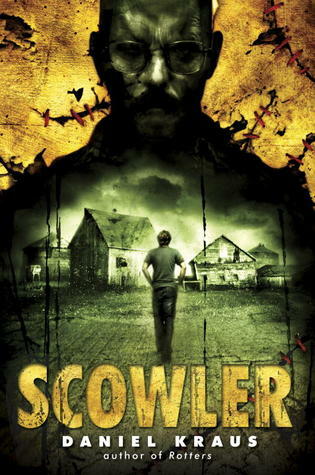 For a horror book, SCOWLER by Daniel Kraus is perfect. Kraus continues to write with great pacing in SCOWLER. I was at the edge of my seat, feeling morbidly curious as to what atrocities Ry and his family experienced at the hands of his ruthless father. This is the kind of book that left my jaw hanging or made me gasp out loud in disbelief. I couldn’t get past the fantastical/magical elements of the novel however. I thought that it was interesting that Ry has an internal, mental struggle that he has to overcome. To him, his childhood toys come to life, and Scowler forces him to do violent things. The fantastical elements of the book played a much bigger role than what I would have liked. Ry’s visions/hallucinations of Scowler take over in the second half of the book. In the end, it just wasn’t my cup of tea. I wished it had less of a fantastical element; I wanted more focus on the real. I kept wanting to move forward with the story and see what was going on in reality. I listened to SCOWLER by Daniel Kraus on audiobook. I think that the audiobook narration by Kirby Heyborn definitely kept me on the edge of my seat. I’ve listened to other audiobooks voiced by Heyborn and I usually enjoy his style. Part of why I probably didn’t enjoy this novel as much as I would have liked is because it is so darn long. While the hardcover edition of the novel is only about 300 pages, the audiobook is over 11 hours long! I didn’t listen to this audiobook all in one sitting, but it was still pushing the limit. Despite loving Kraus’s previous book Rotters, I just couldn’t get myself to love SCOWLER. Ultimately, I wanted less fantastical elements and more of a story rooted in reality. The audiobook was also too long for my liking.